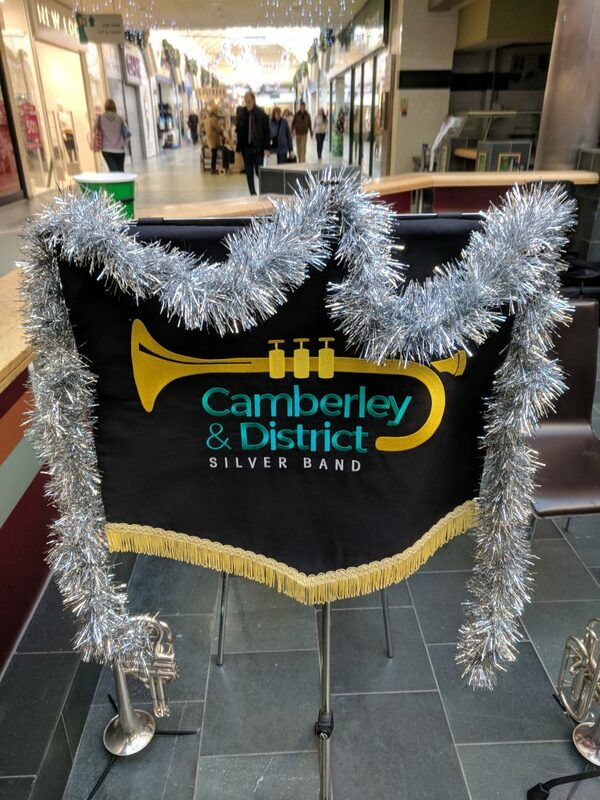 Keep up to date with all the news from Camberley and District Silver Band. 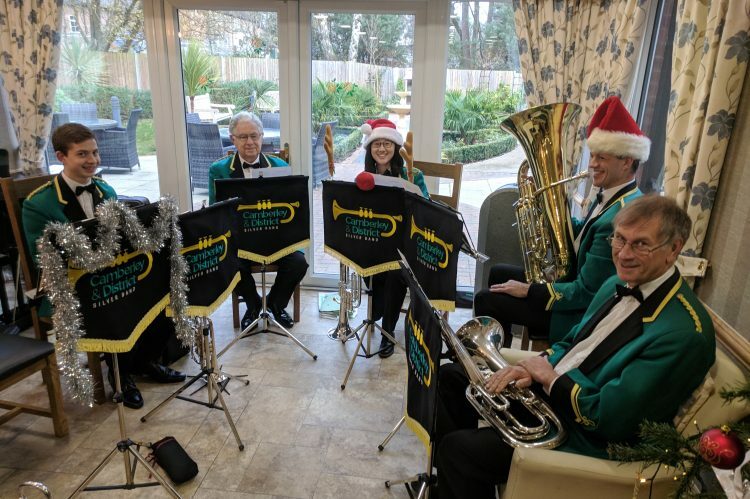 Camberley and District Silver Band have once again been busy with a December filled with Christmas carolling around the Surrey, Berkshire and Hampshire region. We are extremely proud to announce that the result of the band’s collections in Aldershot, Fleet and Camberley has raised £820.54 for the band’s charitable work and this year’s nominated charity, Frimley Park Hospital’s Charitable Fund. 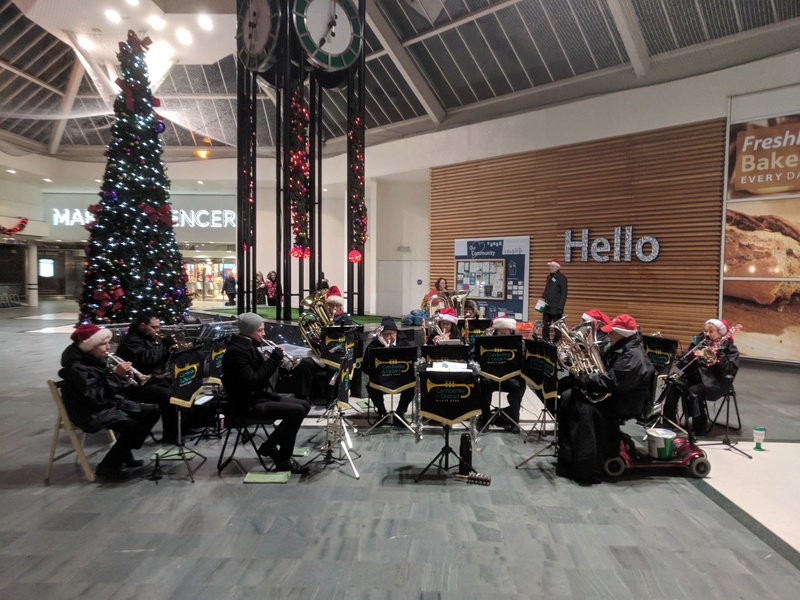 The band was collecting while out carolling at The Meadows shopping centre in Camberley; the Hart shopping centre in Fleet; and the Wellington shopping centre in Aldershot. We were performing our usual range of carols, from the well known to the slightly more unusual. 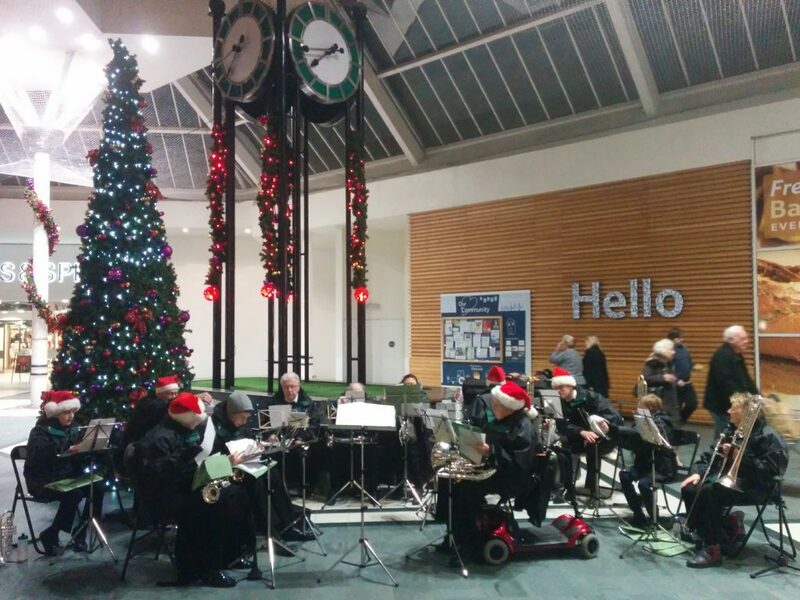 We also had great fun being accompanied by local youngsters on the jingle bells while we were playing Rudolph the Red Nosed Reindeer and of course Jingle Bells. 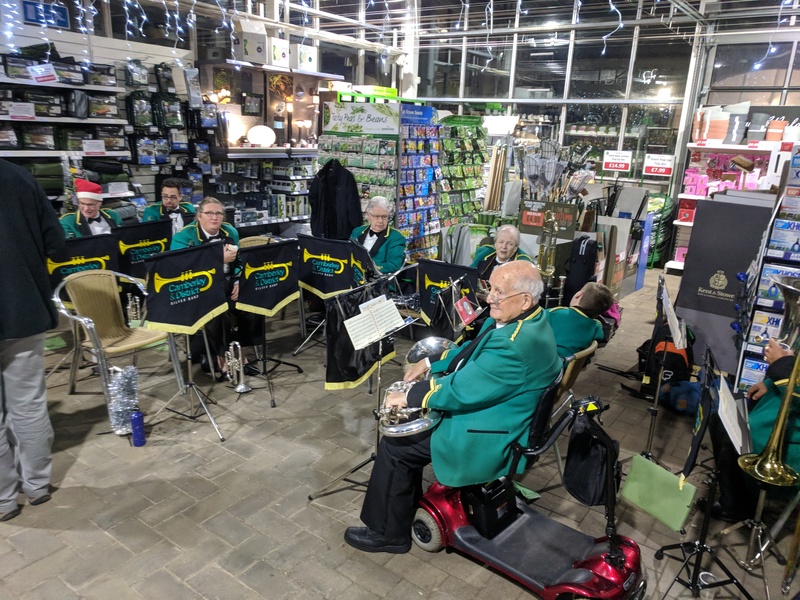 In addition to our usual collecting, the band also played at a number of other events across the season: this included the opening of Kingsclear nursing home in Camberley; at the Camberley Manor care home in Deepcut; and at Longacres garden center in Bagshot to open their Christmas season. 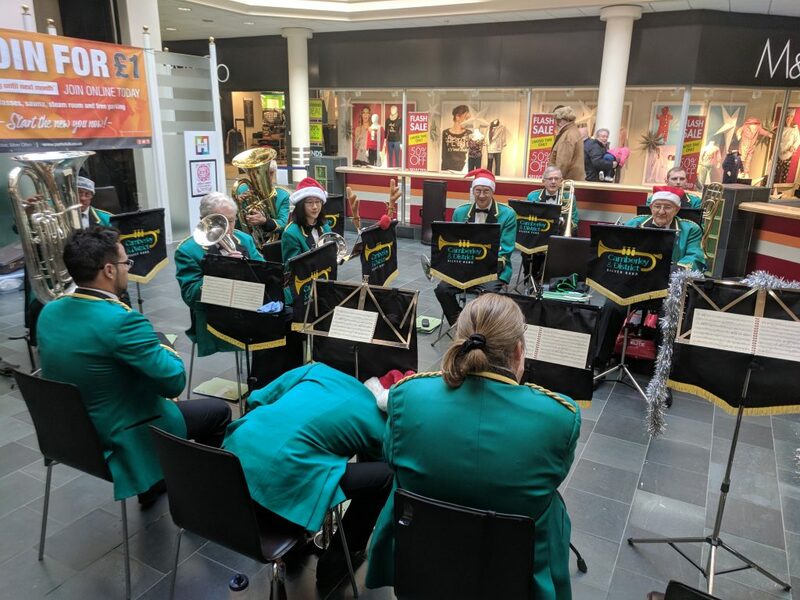 There is one more opportunity to see the band this Christmas, performing in Aldershot town centre from 2.45pm to 4.45pm (more details). Are you looking for some extra Christmas spirit next year, or for some entertainment throughtout the year? The band has a range of music to suit any occasion and budget. 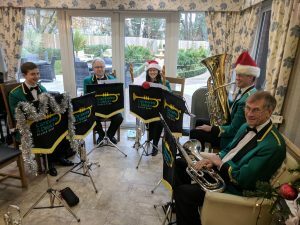 From our popular Christmas Quartet to celebrations, fetes, parties and private engagements throughout the year, we are able to provide that extra sparkle that only live music can do. For details of our range of affordable and flexible performances, get in touch by e-mailing hello@camberleyband.org.uk. 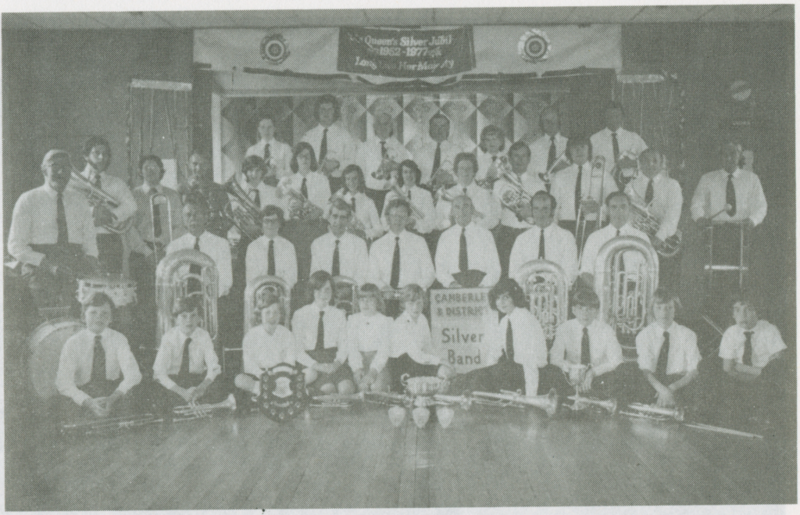 Camberley and District Silver Band was started in Camberley in 1960 (full history). 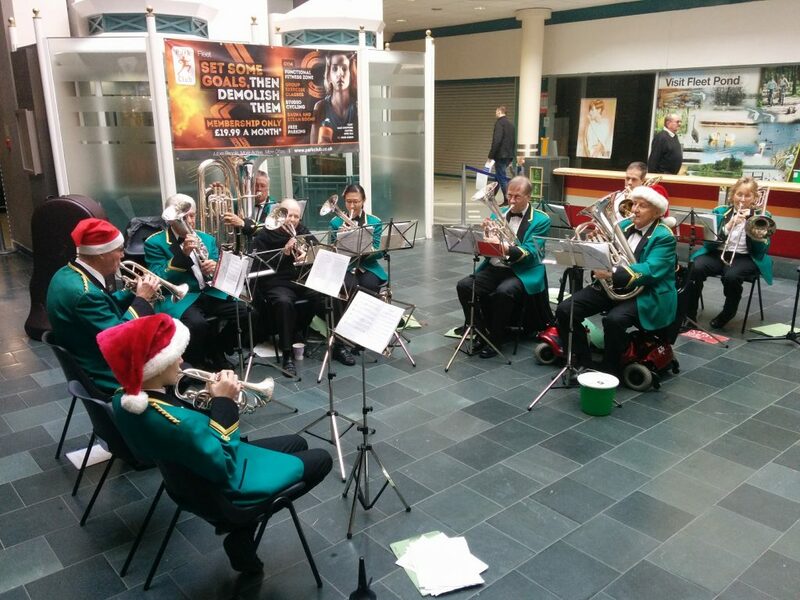 Since then we have become a registered charity providing musical opportunities to young people through brass music, who might not otherwise have such opportunities. Each year we perform a concert with a local school choir, providing them an opportunity to sing in front of a large audience with a band accompaniment. 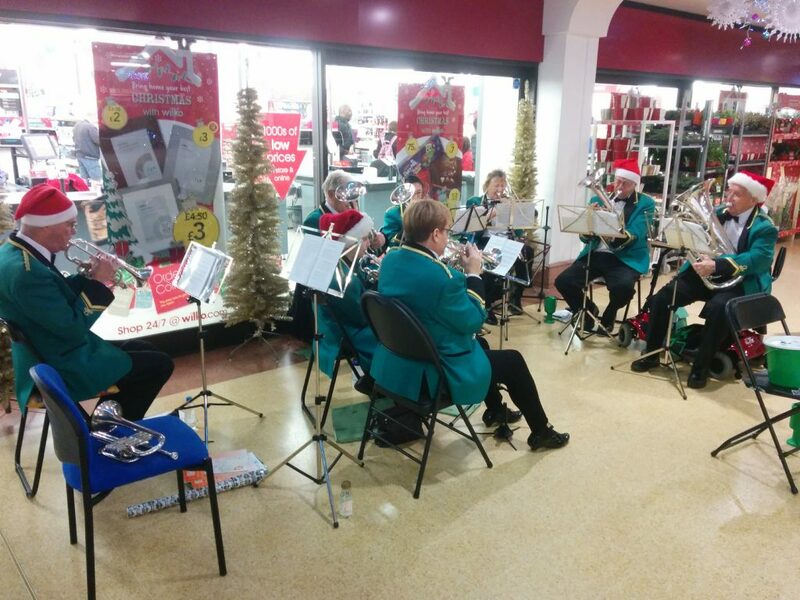 We also run weekly training bands to get young people started with brass music, before giving them the chance to join our main band and perform with us across the region and throughout the year. Interviews are available with the Musical Director. 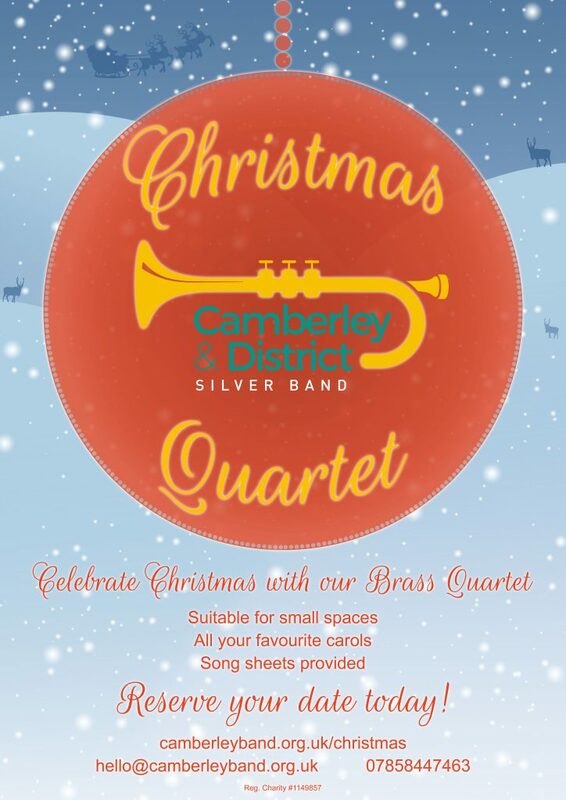 Please e-mail hello@camberleyband.org.uk to arrange. 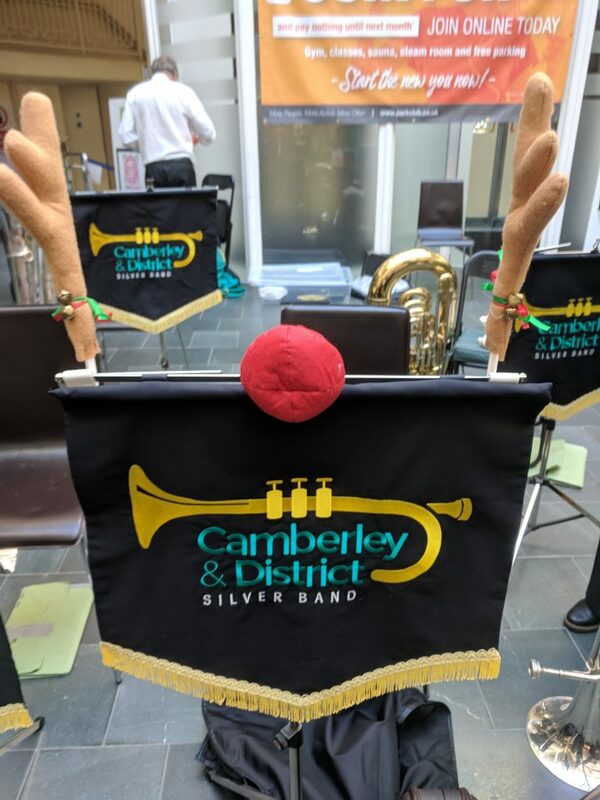 All images and videos embedded below are Copyright Camberley and District Silver Band 2017 and licensed for media use across all platforms in relation to this article. 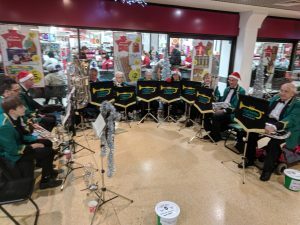 Camberley and District Silver Band performing at the Wellington shopping centre in Aldershot; 16th December 2017. Once again this year, Camberley and District Silver Band have commemorated Armistice Day (Saturday 11th November) and Remembrance Sunday (Sunday 12th November) at a number of events in the local area in partnership with our wonderful community. This year we were fortunate to be invited to perform at three services across the weekend, and some of the highlights are included below. Armistice Day Service with Camberley &District Silver Band.Time to remember and not forget those who fought for our country. The band also regularly plays at St. Peter’s Church’s Remembrance Sunday service. The band rehearses weekly in the hall of the church, so we know a lot of the organisers there, and we like to play for them whenever possible. Playing a full traditional Remembrance service including the full Act of Remembrance, it’s a poignant opportunity for all to come together for a couple of hours of reflection. 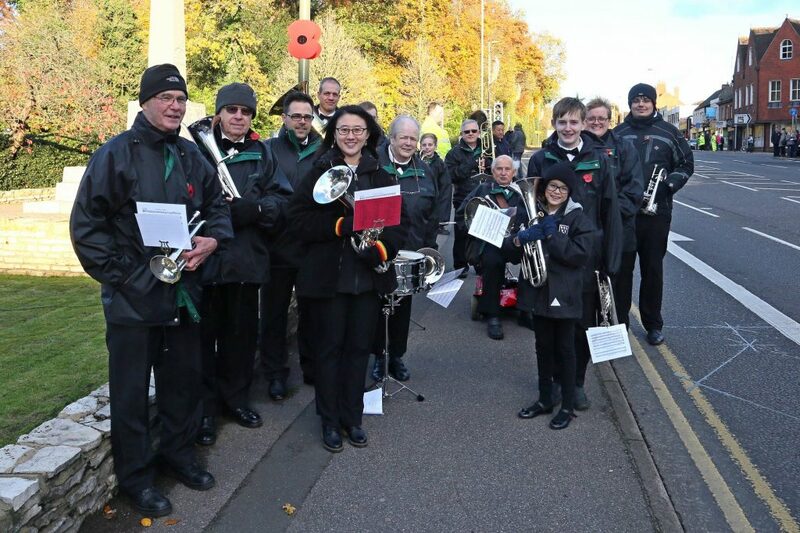 The Camberley Band has had a long tradition of playing at the afternoon Remembrance service on the main road through Camberley. In fact, I couldn’t get some of the band members to admit how many years they had done there! Since we re-launched the website, there has been a placeholder on our History page. In the 56 years the band has achieved a huge amount, and to document that two books of the band’s history have been produced; one covering 1960-1985, and another covering 1985 to 2010. These are an absolute treasure-trove of images, stories and history of this band which has played such a big part in the community over the years. I am very pleased to now be able to make the content of these documents available to everyone to read online. You can view them either as web pages (1960-1985 / 1985-2010) or as PDF documents (1960-1985 / 1985-2010), which are faithful digital reproductions of the original paper books. Please do take a moment to read through these pages – they are fascinating insight into the history of this brilliant band. Merry Christmas to all of our supporters and we look forward to seeing you all at our Supper Concert in the New Year! 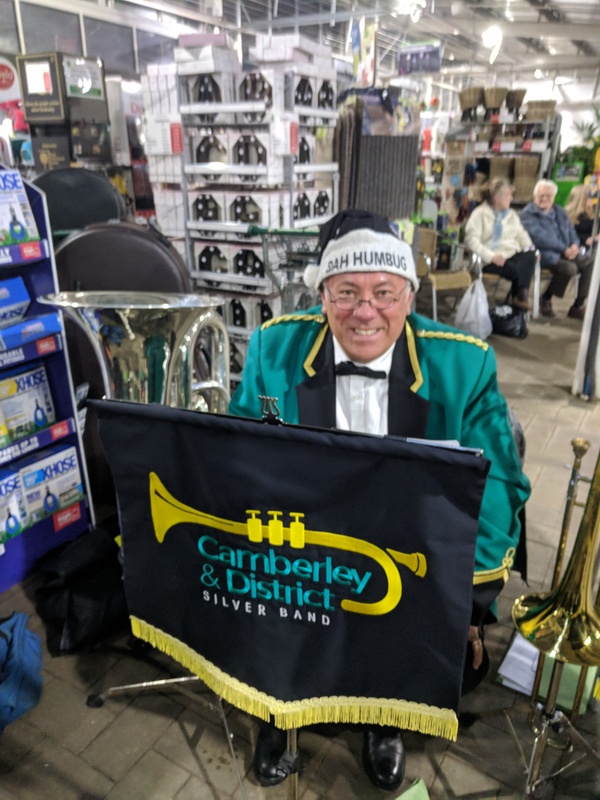 After 12 years at the helm as Musical Director of the Charles Church Camberley Band, Robert Cherry has decided that it is time to step down. 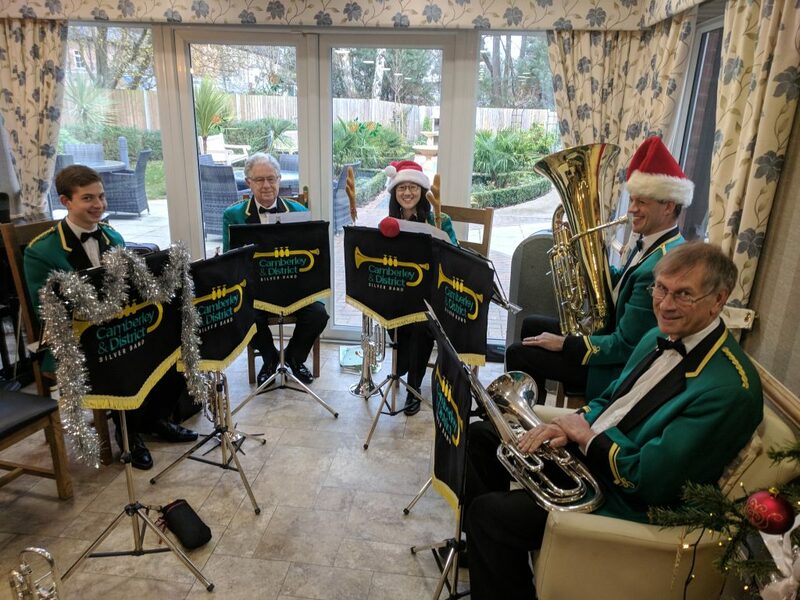 Robert has been part of the band for almost 36 years, initially as the band’s percussionist, but latterly as conductor when he has worked tirelessly, putting the band first and skilfully putting together concert programmes in challenging circumstances when faced with absentees or last minute emergencies. The band thanks you, Robert, for your service and dedication over the years, and hopes that your association with the band will continue. Six sightings of Nellie the Elephant in the Pennines! The Whit Friday Marches are often referred to as “the best free show on earth”. 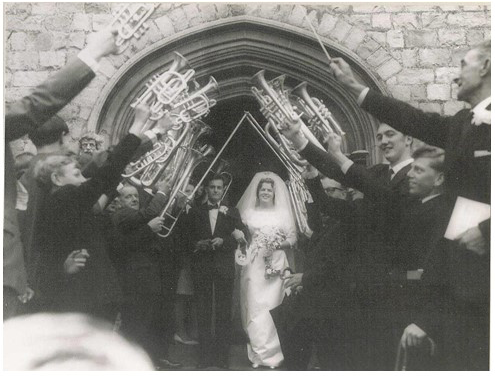 So why do only brass band aficionados and residents of the Pennine villages know about it? This year 126 bands travelled from all over Europe to compete in this annual competition and the Charles Church Camberley Band (CCCB) was amongst them. 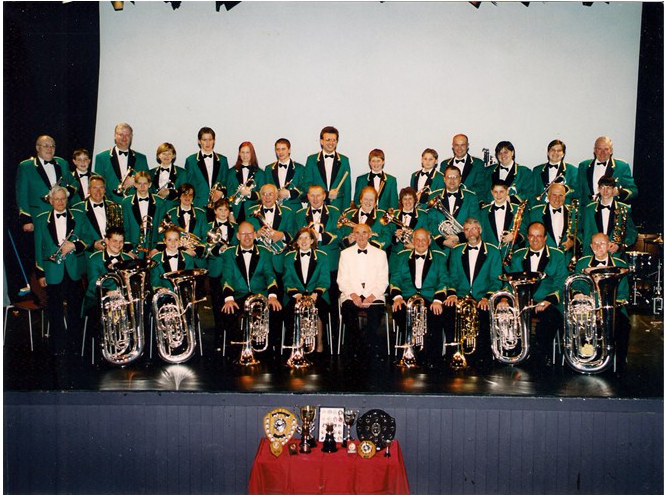 This extravaganza of brass banding starts at 4pm and continues until about midnight on Whit Friday every year. The bands each have a coach to transport them and their supporters to some of the 20 villages that host events. The idea is to compete in as many villages as time allows by playing two marches – one on the move and the second march on a stage. The coach drivers are amazing and many are as enthusiastic about transporting their band to as many venues as possible during the evening as the bands are about competing. The drivers weave around the Pennine’s narrow roads with great aplomb and good spirits. You could be given to believe that the competition is actually between the drivers rather than the bands. However, a band contest it is. On arrival at a village a “runner” is deployed to register the band’s presence. In turn, each of the bands marches in formation whilst playing a march – no mean feat, I can tell you! CCCB was led along the route by a pint sized Nellie as they played “Nellie the Elephant” at the six venues. The part of Nellie was enthusiastically taken by Hector Johnson (3 years), son of two of the players in CCCB, wearing his Nellie the Elephant onesie. Remarkably, he completed all 6 marches before falling asleep in the middle of the road – job done. The second part of the competition takes place on whatever the village has managed to nominate as a stage. The bands play a more complex march upon which they are judged by an expert in brass band music. To ensure fair play, the judging is blind. Bands of all abilities take part in the competition, allowing the less experienced bands to test their performance against the experts. Some of the competitions are restricted to particular sections (like the divisions in a football league) To their credit, playing “Castell Caerffili”, CCCB impressed the judge at Greenfield who placed them 3rd in their section– a great result guys! After such tremendous success, Charles Church Camberley Band could be heading north again next year for another fantastic musical experience. Massive Congratulations to Becki and Tim! Tim and Becki have both done extremely well in their exams this year (A levels and GCSEs respectively), gaining top grades enabling to go on to do exactly what they want to next, and deservedly making them very proud of themselves. Tim is set to go and study Maths and German at Leeds University very soon, so unfortunately during term-time we will have to say goodbye to him, but of course we hope to see him back in the holidays! Becki is set to continue her studies at Farnborough Sixth Form College in Maths and Physics. Louise Lloyd, one of our Euphonium players, graduated yesterday with a PhD in Statistics from the University of Southampton. For the last 5 years, as well as squeezing in work, and the all-important band engagements, she has managed to find the time to research the analysis of road accident data. Louise has kindly offered to have a long and in-depth conversation about her thesis ‘Modelling Trends in Road Accident Frequency – Bayesian Inference for Rates with Unknown Exposure’, but has yet to find a volunteer! In the meantime she now has no more excuses for not practising the Euphonium part for Bohemian Rhapsody! We offer Louise hearty congratulations for this achievement. The band congratulates horn player David Giles on recently gaining his Masters degree. David studied for a BA(Hons) in Politics and Law for three years at the University of Essex, graduating on the Colchester campus in 2011. He then undertook an additional year to complete an LLM (Master of Laws) at the University of Reading in International Law and World Order, graduating in December 2012. He is currently doing temp work whilst applying for more permanent positions. Ultimately, he would love to end up working for the UN or the Foreign Office, particularly as he specialised in Nuclear Disarmament during his Masters. The morning of June 1st 2012 dawned, bright, sunny and early once again for those of us in Charles Church Camberley Band off on our second trip to the Oldham area for the Whit Marches contests. Again we visited seven villages, several we’d been to on our last visit, but some new; and this time we had a novelty march to play too, “Chicken Run” arranged for us espcially by Owen Lloyd. After a busy afternoon and evening of jumping on and off the bus, marching, playing the contest march and then doing the same all over again at the next village, we returned to our hotel, exhausted but happy and contented. Once more it had been a fun-packed event for us.